I was thinking of a recipe that might be similar in sushi for spicy tuna and this is pretty close. One night when we were out at Tokyo Grill, I asked the sushi chef what made up the spicy sauce for the tuna and it’s just Sriracha and mayo mixed together. I bet the texture could be achieved if you cubed the tofu very, very small. This can be used for make at home sushi or over rice in a bowl, which is a go-to meal for us during the work week with some steamed or stir fried veggies. This is spicy. So if you want to dial it down a notch, half the Sriracha or even quarter it depending on your tolerance. I like this with avocados and kale over brown rice. It cools it off a little but still tastes tangy. 1. Heat nonstick skillet over medium-high heat, and add half of tofu cubes. Cook 10 to 12 minutes, or until cubes are golden, stirring occasionally. Transfer tofu to plate, and repeat with remaining tofu. 2. Stir together soy sauce, Sriracha, vinegar, mirin, maple syrup, sesame oil. 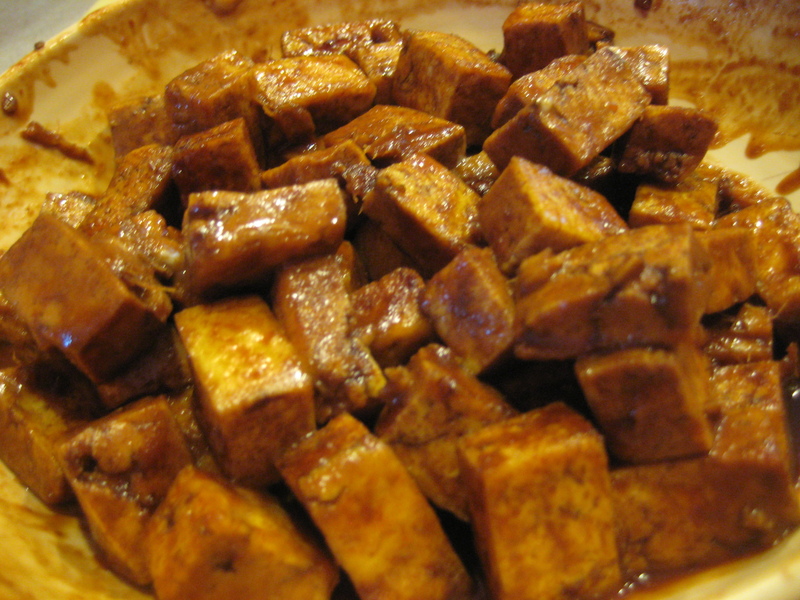 Return all tofu to pan, and add soy sauce mixture. Bring to a simmer, and cook 2 to 3 minutes, or until most of liquid is absorbed. Remove from heat, and stir in mayonnaise. Serve warm or chilled. Mr. Wonderful and I are crazy about sushi, you can typically find us at either XO on a Tuesday night (half off), or Tokyo Grill on a Friday night (best selection in town, plus crack ginger dressing for salad). We are sushi-at-home amateurs, but that doesn’t stop us from trying to do this every now and again. The end results taste a lot better than they look. Japanese mayo differs from regular mayo in that it’s made with rice wine vinegar. You can just as easily use regular or low fat mayo here but I wouldn’t mess with fat free. Get serious. You are basically eating negative cals with sushi, so do it up with a delish sauce. Mix together the above ingredients. Serve with rolls, on rolls, inside the rolls…basically you might consider this for a mask at some point too. It’s pretty delicious.